Share the One Direction dream! Fans of One Direction will have the opportunity to live the life of the famous boy band this Easter, by taking part in One Direction: the Musical. A week-long performance workshop, run by the Star Project Theatre School, will give kids the chance to take part in a show all about the band. Based on an original script written by Star Project Principal Jo Edwards, the show will include plenty of 1D hit songs and anecdotes of the rise to stardom of the famous five. The workshop is open to children aged 4 to 18 and takes place at Barnt Green Parish Centre, April 21 – 25. It costs just £99 per child, with a performance for family and friends on the last evening. 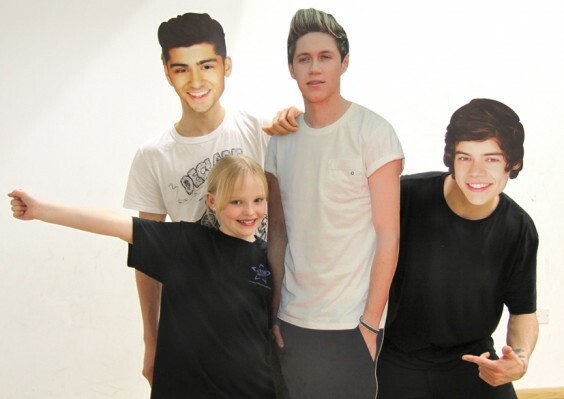 Above: 1D superfan Olivia Brown, who was the first to sign up for the musical, poses with ‘the band’.